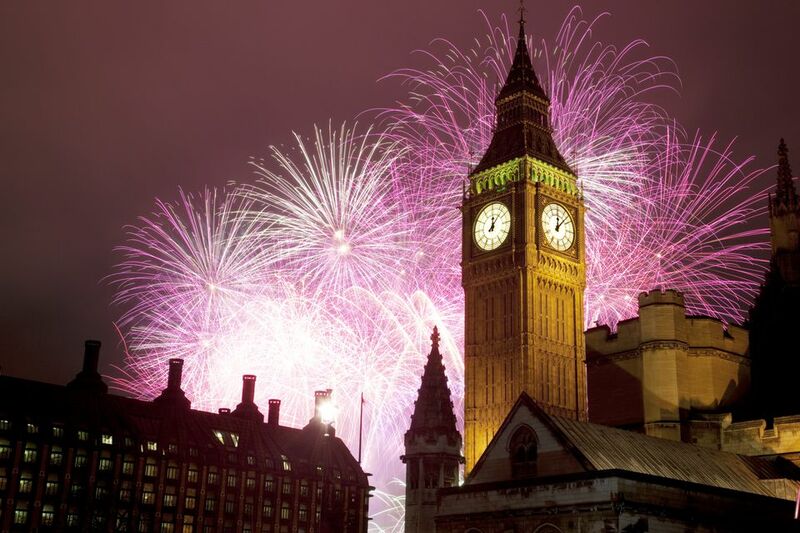 Celebrating New Year's Eve in London is a once-in-a-lifetime experience. Expect fireworks, sell-out club nights, late-night bar events, and plenty of fun out on the streets. Trafalgar Square used to be the focal point for London NYE celebrations but nothing happens there anymore past an usually large screen to see the fireworks happening on the South Bank. The London Eye has stolen the thunder of the traditional New Year's Even on Trafalgar Square and is now the place to be. Free tube travel is usually available from 11:45 p.m. until 4:30 a.m. Use Transport for London's Journey Planner or the Citymapper app to plan your route by public transport. The big event is fireworks by the London Eye. It's a ticketed event and tickets cost £10. 100,000 tickets are made available to the general public in September with only four allowed per purchaser. The event begins on Monday December 31, 2018 at 8:00 p.m. and ends officially at 12:45 a.m. on the first. The fireworks display starts after Big Ben chimes at midnight and the display lasts for around 10 minutes. If you're looking to watch the fireworks but don't have a ticket, consider heading to Westminster Bridge and the north embankment of the River Thames, opposite the London Eye. These areas are outside the ticketed zone. The fireworks are visible from across central London, as well as being broadcast live on BBC1. As you would expect, tickets for London clubs are more expensive on New Year's Eve. Also be aware that pubs often charge an entrance fee to try and control the numbers. It is best to plan ahead and get tickets in advance and strategize where you want to ring in the new year. A luxury river cruise along the River Thames can be a romantic way to bring in the new year. Most boats plan to moor in sight of the London Eye fireworks at midnight so you will get the best view. Companies who have New Year's cruises include Silver Fleet, Bateaux London and, although permanently moored, the R.S.Hispaniola is on the Victoria Embankment with a perfect fireworks view and offers dinner, dancing and champagne. You can you dine with King Henry VIII in attendance at the Medieval Banquet in St. Katherine's Dock, near the Tower of London. Enjoy a banquet with live entertainment from King Henry's court. Plus you get to dress up too! Restaurants like Duck & Waffle and Sushisamba often put on special New Year's Eve events with live music, DJs, and stunning views of London. If you're really looking to do it up big, the Ritz hosts two black-tie dinners with live music including a marching band and a traditional piper at midnight. A huge New Year's Eve Party is held at Southbank Centre. It's an extravaganza of music, fireworks, dining and cocktails. For one night, the world-famous Royal Festival Hall is transformed into a set-dressed spectacular: five floors of themed club nights, seven bars, two live acts, twelve DJs, eight dance lessons, and outdoor spaces offering the perfect view of the UK’s largest annual fireworks display. The Barbican has had the tradition of a Viennese New Year's Gala for over 25 years. They invite you to enjoy an evening of family favorites from the Strauss family and friends. There's both a daytime gala for the family and evening gala.